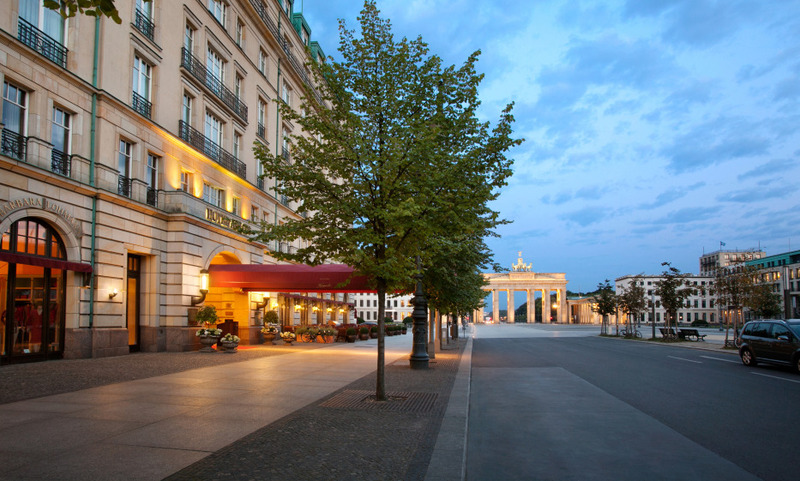 Located opposite the Brandenburg Gate and minutes from the Potsdamer Platz and the Reichstag, calling the Hotel Adlon Kempinski prime real estate is an understatement. There are hotels in central Berlin, and then there’s the Hotel Adlon Kempinski. Found opposite the Brandenburg Gate - 100 metres opposite, to be precise - and minutes from the Potsdamer Platz and the Reichstag...calling it prime real estate is an understatement. Top floor suites come with the best views of Brandenburg you’ll find in the city, so does the terrace at its Michelin-starred Lorenz Adlon Esszimmer restaurant. But for the Berliners who've seen it all and who flock here for power lunches or after work drinks at the Sra Bua Bar, the appeal lies on the inside. Solid marble staircases, a dazzling Murano chandelier, crackling fireplaces and a glass cupola ceiling where the city’s other half congregate for the ritual of afternoon tea… The Hotel Adlon Kempinski is an ode to Old World European charm right at the heart of Berlin’s cultural center. Kindly note that the wellness area will be closed for renovations through mid-September 2019. The pool, the fitness area and the changing rooms will continue to be available without restriction. Fantastic location right next to Berlin's famous landmark Brandenburg Gate. Be pampered in the 9000 ft spa facilities in the Adlon Spa by Resense. It is a great hotel with a wonderfull staff and we are not only travelling to Berlin for Berlin but also for staying in the Adlon! This was a very special hotel and certainly the best I have stayed in, in Berlin. It has the ambience to really transport you back in a time and the rooms were very grand and suited the hotel. The food for breakfast was amazing and the best buffet choice I have ever had. The massage I received in the spa was literally the best massage I have ever received in Europe. I will definitely go back to this hotel!!! This is one of the finest hotels I have ever stayed in. Service and employees were impeccable. Hotel Adlon Kempinski Berlin was one of the finest hotels we have ever stayed at, not only was the hotel absolutely beautiful but also the location was excellent. The thing that what separated this from every other experience was the courtesy the helpfulness and very high degree of professionalism of the staff. They were all excellently trained and efficient. We are anxiously awaiting to visit this hotel again in the future. This is the best hotel in Berlin. It is in the perfect position for sight seeing. I cannot imagine staying anywhere else in the city. The best hotel in Berlin and with a great central location as well. A perfect location, wonderful staff, great choice of places to sit eat and drink! Then when I wanted complete relaxation I had a perfect spa experience. Thank you. Superb one of the best hotels I have stayed in. As a single traveler I would prefer one double bed not two single beds pushed together. Its a wonderful hotel, the rooms, the service and the food are first class. Looking forward to coming again. Staying at the Hotel Adlon was one of, if not the, most enjoyable hotel experience we have been fortunate to know. Thank you! Fantastic location next to the Bradenburg Tor. It is every bit the iconic hotel it is reputed to be and you can't help but feel the sense of history, glamour and elegance throughout the hotel. It is THE place to stay in Berlin. We were several times in the Adlon with great satisfaction. This time, there has been an incident during breakfast in Quarré but our &quot;guest relation manager&quot; had worked hard and done her very best to help us for the next morning. great Hotel, very good service, i will come back. The Adlon was absolutely faultless and everyone was so lovely to deal with....no stuffiness at all. Loved it loved it loved it, just wished I could have stayed there for another week! It was my birthday and we were upgraded from a deluxe room to a junior suite which was just the best birthday gift I could have hoped for, it made my birthday all the more special. I have already passed on how wonderful the stay was and the whole experience to many friends and family. Indeed I text my brother as he is going to Paris for my sister in laws 50th and I have told him to look for a Kemplinsky hotel there and let her experience the magic as well. I hope that in the future I am able to come back. Thank you to everyone for a wonderful experience. it's a world of his own. We enjoyed our stay. We got in touch with history! Hotel and service excellent. Very nice hotel in a great location. Overpriced breakfast. the friendliness of the employees is outstanding!! A little too expensive, but it's worth it. Beautiful hotel, great location, great service. Staff very kind. Especially Ladies in Red were very nice to us. Air conditioning in room 578 was very deficient. You cannot increase nor decrease the temperature.